Right, that's it from me this evening. Scroll down to soak it all in if you're just arriving, and read Gary Rose's match report. You can also head over here to follow Leicester v Manchester United - which is about 15 minutes in. Burnley manager Sean Dyche, speaking to BBC Sport: "They were the better side. They were top class, even though they have been a bit up and down this year, they can always hurt you in different ways. They pressed us well, defended from the front and yes they got a big start with the penalty obviously. We ground back into it by half time, they scored a second, and then it was tough for us." On Dele Alli's yellow card challenge and the penalty: "You see them go. He is out of control and you see red cards for that. For the penalty he is going down after the contact, which is minor contact at best, so that's a really tough one too. The irony is that I thought the one that was a penalty was when Ashley Barnes went down at the end. Serge Aurier is the wrong side, you can't put your elbow in someone's face. Then for Sam Vokes' header, I think that is a clean header, I would be looking at the keeper there. These are things that might have given us a smidgen of a chance, but they were the better side today. "We have to look at the bigger picture. You feel these results as a manager because you want to compete against everyone. We are mature and moving forward and we know where we are at. There is a lot of tough work coming up." "First of all I have to congratulate Harry - it's the same record as Alan Shearer. Then the team - they were amazing. We needed this type of victory and we got the three points. "It's difficult to find words to describe Harry Kane. Even during my time at Spurs I'm surprised by him. The hat-trick is nice for him but we could have scored more than three. I'm worried when you don't create chances though. "We were really solid - it was a solid performance. We recovered our spirit in the way we played in the last two of three seasons. "The penalty was a penalty. The crowd started to focus on Dele Alli [after he won the penalty]. He has a great personality and character and you can't intimidate him. "We are now in a position we can fight for the top four which is important after the loss to Manchester City." Burnley manager Sean Dyche speaking BT Sport: "The best side won on the day. They're a top class side - they did the basics. They showed us respect by showing they would have to earn the win. The yellow card for Dele Alli - whether it could have been a red? "It was a tough one - Dele Alli is out of control - he was never going to get the ball. Number of years ago that was just a big challenge, but it's a tough one today - an orange card. "The penalty was a tough one but generally they get given. I think it was a penalty after Barnes was fouled. "The one person I've not mentioned is Harry Kane - he's a fantastic player. He must be up there with one of the best strikers in the world. "You lick your wounds today. They turned up and we didn't quite. Overall, I know where the club is at. We have to be really happy where the club is at." A quick reminder that the final Premier League game of the day - Leicester v Manchester United is already up and under way. You can join Shamoon Hafez for that one over here. Tottenham manager Mauricio Pochettino, speaking to BBC Sport: "It was so important to us to perform how we did, to recover our feeling and level. It was massive for us. The team today fought, it was a massive battle, Burnley are doing a fantastic season, for me it is an amazing performance. "The feeling was really good. We are in a good position now, we are fighting for the top four, this shows everyone we are there, now we need to be solid and consistent, today is a good platform to go up." On Harry Kane: "He is amazing, a fantastic player, he needs one more to be above Alan, we will see the next game. But it is fantastic for him, he could have scored more than three today because the chances were there. I was a little bit frustrated we have not scored more - there was a massive chance for Son, for Sissoko, I feel sorry for them, but they need to keep going and the next games they are going to score, no problem." It might only be on goal difference and it might 'only' be a scrap for fourth spot at present but Tottenham's victory means they will be above Arsenal on Christmas Day for the first time since 2011. A reason to celebrate in one part of north London at any rate. In Europe's biggest five footballing scenes (France, Spain, Italy, Germany and England), only two players have scored more than Harry Kane in 2017 in all competitions. Kane has 46, but Paris St-Germain striker Edinson Cavani and Barcelona forward Lionel Messi have 50. Tottenham's hat-trick hero Harry Kane speaking to BT Sport: "It's a nice present that's for sure. Tough game, we knew it'd be tough - it was 3-0 but we could have had more. "I am aware I've equalled Alan Shearer's record [of 36 Premier League goals in a calendar year]. Just going into this game I thought I can get a couple and then there's Southampton to play. "You always want to finish a game off away from home. We didn't want to give them an incentive. "I thought Dele Alli played great today. The challenge in the first half they both went for it and I thought the penalty was a penalty. "It was a difficult place to come. Let's see what happens on Boxing Day." Here's another killer stat on how difficult teams have found it to score at Turf Moore of late. Today, Burnley conceded as many goals as they had in their first nine Premier League games at home this season. Makes Harry Kane's destructive display all the more impressive. Dan, Derbyshire: The plaudits will rightly be for Kane tonight, but don't forget the important role Davinson Sanchez played today. He was excellent and has been missed these last three games. Once Alderweireld and Wanyama are back, Spurs should be right on it. There was a lot of chat about Burnley's defence and goalkeeper before this game - and rightly so, they'd only conceded 16 goals in 18 matches before today. 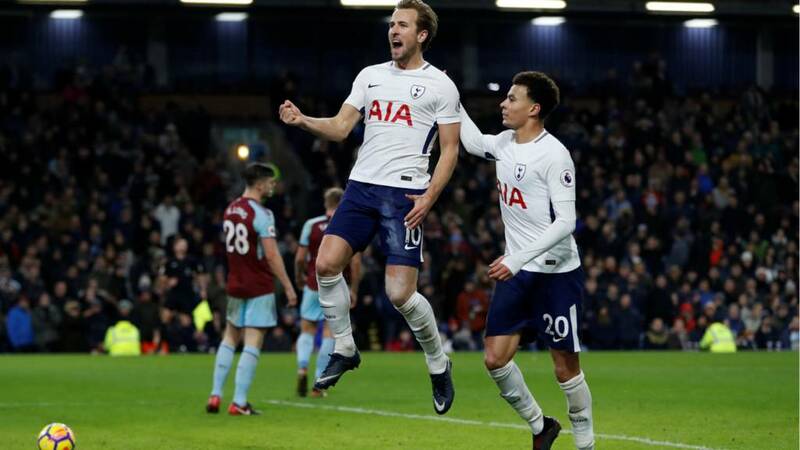 It's testimony to Spurs' performance that they are the first away team to score three goals in a league game at Turf Moor in almost three years - since Crystal Palace won 3-2 in January 2015. No matter what Harry Kane gets for Christmas there will be only one thing on his mind between now and his first turkey sandwich of 2017. Three goals today has moved him level with Alan Shearer's record of 36 Premier League goals in one calendar year. Shearer did it with Blackburn in 1995. Kane has 90 minutes left to do better. Spurs play at home to Southampton on Boxing Day. Steven Defour knocks it up to Ashley Barnes, he's crowded out and a cross comes in, Hugo Lloris is unconvincing with his scruffy punched clearance. The game is up but Sean Dyche is still down there barking orders at his players. Spurs are moving up to fifth for Christmas Day - one point short of the top four. Burnley are undone again as they continue to press hard for possession, always one change of pace too slow to keep up with Spurs. Christian Eriksen looks to slide Harry Kane through to the left of goal, but the pass is too heavy. Dele Alli milks the boos/appluads as he makes way for Fernando Llorente. For Burnley, Nahki Wells takes Scott Arfield's place in attack. There could be more. Chrisitan Eriksen plays a delicious through ball up to Erik Lamela, but it's just cut out by the covering left-back Charlie Taylor. The corner is cleared and we've got about five minutes until Harry Kane will officially stop scoring for another weekend.